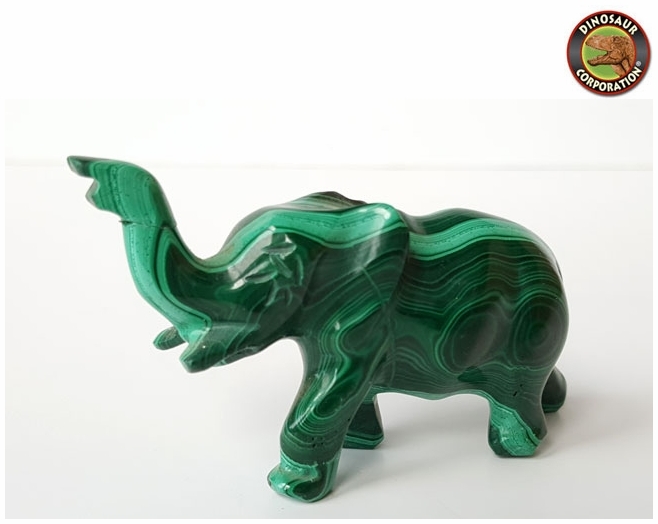 Finely detailed hand-carved malachite Elephant figure from South Africa. The dolphin is jumping out of the waves. This beauty does stand up on it's own base. A perfect birthday gift for Dolphin lovers. * Size: 2 1/2" H x 1" W.
In China, India and Africa, the elephant is a symbol of beauty, power, dignity, intelligence and peace. The elephant is generally considered a symbol of good lu. Malachite is a stone of balance, abundance, manifestation and intention. Malachite absorbs energy and draws emotions to the surface. It clears and activates all Chakras, and is especially helpful in the stimulation of the Heart and Throat Chakras. An extremely powerful metaphysical stone, Malachite is often called the �stone of transformation� and is used for deep energy cleaning, bringing healing and positive transformation to the wearer. For this reason, many metaphysicians recommend using Malachite in small doses. Malachite amplifies energies of all kinds, both positive and negative. One of the most important healing stones, Malachite helps the user acknowledge, draw out, and discharge negative energy, including old emotional patterns, past traumas, and suppressed feelings. Malachite�s ability to draw out negative energy can assist in discovering the energy blocks and patterns that may be causing physical disease. Note: Malachite absorbs negative energy easily, but holds it within the stone until it is cleaned, so it is important to �clear� your Malachite often. See the News article in the left navigation that offers some methods of clearing your crystals. Do not use salt to clear polished Malachite as it will damage the finish.